There are somewhere between 300 and 400 Orchid blooms on the kitchen counter. Who has the time to count them accurately. 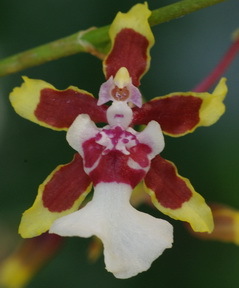 Oncidium ‘Sherry Baby’ is growing in a 15 cm clay pot and is obviously very happy there. There are four bloom stalks, 2 open and 2 about too, each carrying nearly a hundred blooms, each bloom is about 3 cm in diameter and as you can see from the picture, a fascinating colour pattern. Waiting! In other exciting news, I’m writing this while waiting, not very patiently, for the second call from the hospital in Ottawa where the next grandchild is about to make its appearance. The truck is idling in the driveway, ready to go. Well not actually idling as that would be environmentally unfriendly, never mind the cost of fuel. We can’t stay in Ottawa of course because the new mother’s sister is the bride the following week and there seems to be a list. I have to get the garden close to perfect for all of the people who will be arriving to see it. New Lawn Time! As she left this morning, the Assistant Gardener, commented on the nice new treatment where the ‘grass’ (read weeds,) paths were between the beds in the front yard. They are currently killed and rototilled and it does look better than the weeds. Labour day is the best time of year to seed a new lawn. All of my visitors for the labour day weekend wedding, will want to walk about the gardens and that might be hard on newly seeded turf, so it’s off to the sod store for some instant grass to unroll. I would really like the time to research the proper seed for high traffic areas and use that but that’s not going to happen this year. The multi-variety fescue mix, sold as Eco-Lawn, looks quite good at the front of the yard. I like the look of the fine bladed grasses. It never did well on the narrow paths and I can only attribute that to an inability to withstand the traffic. Leaves Turning White! I had to go around and water all of my containers this morning because we seem to actually have gone close to 3 days with out noticeable rain. A record for this summer. The white Mildew is rapidly spreading across an interesting variety of plants. The Papaya pear summer squash in the container on the deck is covered. Most of the similar plants in the garden or OK. There are three different Tuberous Begonias on the wall of the house and even though they touch each other, only the middle one is infected. 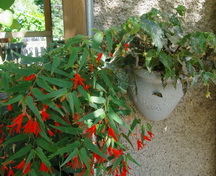 The very same variety, in a hanging basket,( lots more air movement,) right above it is fine. Gardening always seems to pose many more questions than it answers and when that happens to you, you ask me the question and I’m sitting on my deck with this very intermittent Mildew scratching my head and trying to figure it all out. Has to be the varietal difference and (mostly,) the increased air flow! Lazy Gardening! Here is a perfect lazy gardener’s solution to a problem. My upright English Oak has been declining for a couple of years from no cause that I could determine and last year it was definitely dead. Its at the front of the house on the verge between the lawn and one of the big perennial beds. Digging it out was a job I didn’t even want to contemplate. This spring I trimmed out all of the small twiggy branches, leaving a skeleton with an interesting shape and planted Morning Glories around the base. Needed a bit of netting around the trunk for them to get started on but look what a bit of laziness can achieve. Tried a different variety, Glacier Star, not my favourite Heavenly Blue and each flower is delightful but they are a bit pale to make a mass statement when driving past them down the street. Always look for innovative ways to turn a problem into a feature. Thinking can be much easier than digging. It’s two days later and I’m back from Ottawa and my new grandson is just delightful, of course. The Bride Asks? Will the pots of Impatiens that you cut back three weeks ago be in bloom again in time for the wedding? Ken Answers! They are covered with new buds and we have 9 days to go. If they don’t bloom I’ll just leave town! Charlotte asks? The earliest ripening Tomatoes have large brown soft spots on the bottom. What’s happening? Ken Answers! You have ‘blossom end rot.’ This is a disease with two causative factors. It patently isn’t insufficient water as is often thought but it is connected with wide swings in the water regimen. If the plants are too dry and then wet, blossom end rot may show up. Very difficult to control in a year with as much rainfall as we have had here this year. It is also affected by the calcium availability. You can do nothing about the calcium at this point in the season. Next year, as insurance against this problem, throw a little calcium in each hole as you are planting your Tomato plants. Simple source of soluble calcium, powdered milk.